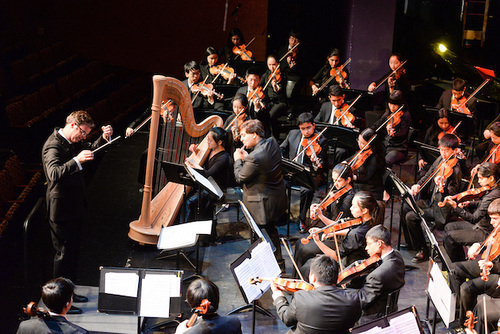 This year’s Spring Orchestra Concert on April 18 brought the middle and upper schools orchestras together on stage at the Mexican Heritage Plaza Theater in San Jose, delighting the audience with traditional, classical and modern selections. A trio of grade 6 groups, led by director Dave Hart, performed first. Grade 6 Winds first played the traditional Irish folk tune “Danny Boy,” followed by “Let It Go” from the 2013 Disney film “Frozen,” with both pieces arranged by the students of the ensemble. A special treat that evening was a series of performances by the middle school chamber groups. The first was an all-grade 7 ensemble comprising Christie Chen on alto saxophone, Arushee Bhoja and Connie Xu on guitar, Donna Boucher on flute and Sonal Muthal on violin. Grade 7 students Arthur Oung on cello and Tiffany Wong on harp were the second group to perform, and the grade 8 duo of Justin Au on flute and Andrew Semenza on piano played third. The Harker School Orchestra, directed by Chris Florio, fresh off of winning a Gold Award at the Chicago International Music Festival, headlined the evening, playing works from Wagner, Shostakovich and Mozart. A highlight was the West Coast premiere of Jeremy Van Buskirk’s “… such as I am you shall be,” which the orchestra played for the first time in Chicago.